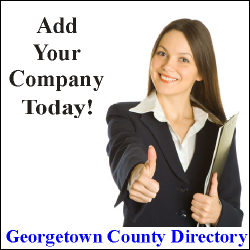 Add Your Company to Georgetown County Directory! There are a few ways that your company can become part of Georgetown County Directory! Our "Lifetime" Option! ---- Just A One-Time Price! ---- No Renewals! Our Most Popular Plan! You can have a "Lifetime" Full-Page Company Profile instead of a regular listing! You are part of Georgetown County Directory and visible on a) the Main Directory Page b) inside of a category (or categories) that pertain to your company c) in a city's 'companies' page and d) featured from time-to-time on our front page! Plus Tons More! Great exposure for companies that have a business/fan Facebook Page and a Twitter Page (both a requirement) - also that have a store-front or a physical address that is open to the public. See Example | Learn More + see bonus features! Sponsor A Page of any of the pages on Georgetown County Directory! If you see the This Space Available Ad on the right side of a page, you are able to sponsor that page with a 250x250 static image ad with a direct link to your website! Only $95 / year More Info / Sponsor Page Please note: You may select this option as a stand-alone option for your company -OR- as an addition to either #1, #2, or #3 above. If your company has a company profile with us, the link from your sponsorship ad will be directed to your company profile! News that shows in each city's "news" page! Events that show in each city's "events" page! Jobs that show in each city's "jobs" page! Products that show in each city's "products" page!